Ben and Jamie had a photo shoot the day before the wedding to take some informal portraits. 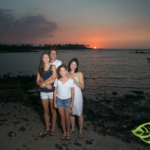 It was a beautiful night at the Mauna Lani Bay Hotel; we visited the ponds, the wooden bridge and the coast line for photos on the beach. The Mauna Lani is located on the west coast of the Big Island of Hawaii.